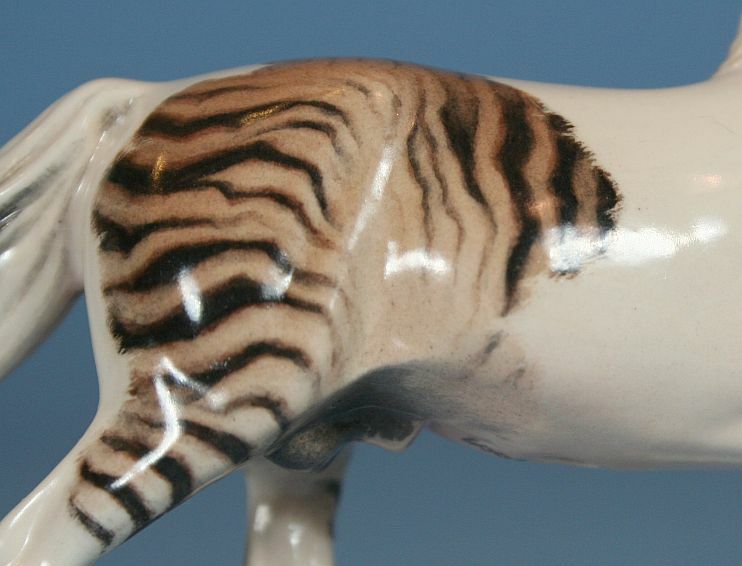 This little wonder is the very small mini Pour Horse "Nomad" sculpted by Kristina Lucas-Francis and produced in earthenware ceramic bisque in limited numbers by Joan Berkwitz. 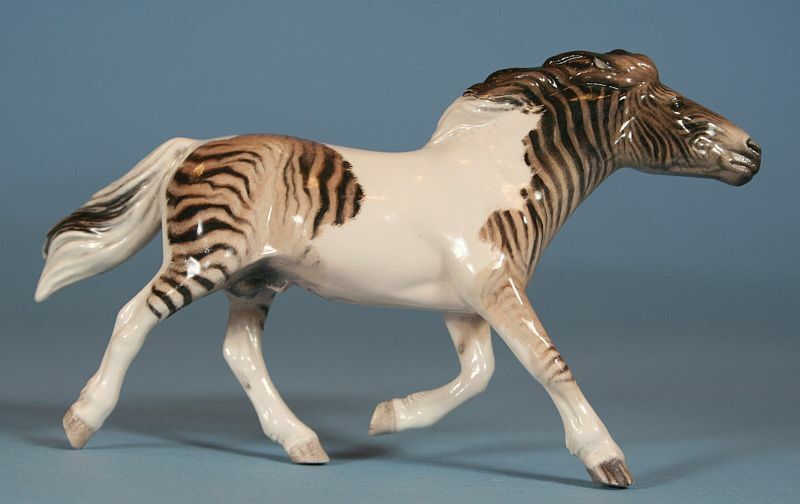 Originally sculpted to represent a primative Tarpan, I thought that this snotty fellow's attitude and build suited a special project to become a tobiano pinto, striped Zorse! Using photos of a super cute real live pinto zorse filly that resides in Germany as my inspiration, this piece was created using a slightly altered pattern on the same base color. I am very pleased with how this fun piece came out! 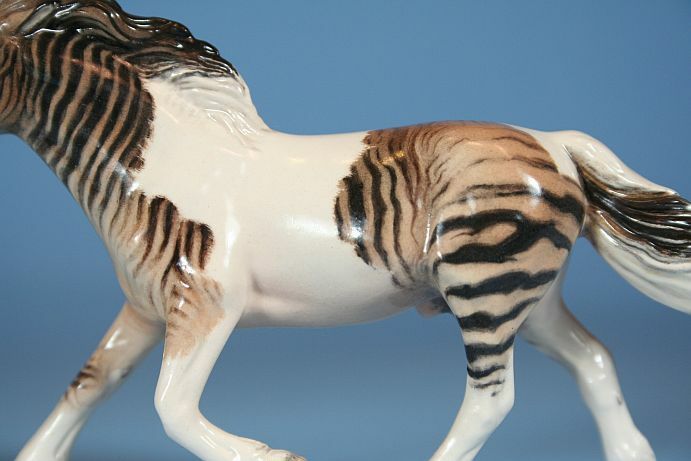 Now owned by Marla Phillips, the custom glazed Zorse was completed by me in August of 2007 and sold through a lottery offering on my Hanblechia Studio Yahoo news group. 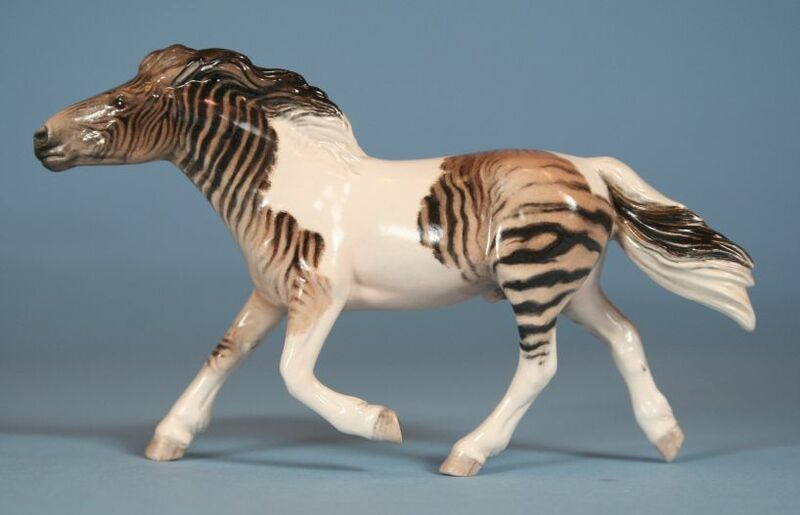 Some of the pieces's satin glazed detailing includes shadowing on his striping pattern, stripes both in dark brown and black that fade underneath, hair pattern edging to his simple tobiano pattern, and detailed shell hooves including the frogs and bars painted underneath each foot! Though washed out in my photos as usual, this piece also has mixed grey and yellowish tints to the white of the mane, tail, and feathers on his feltlocks - and pink tinted underbelly and private parts.